November 27, 2015, Queens, NY Lots of smack talk, (particularly from one of the combatants), much anticipation, and a championship on the line. 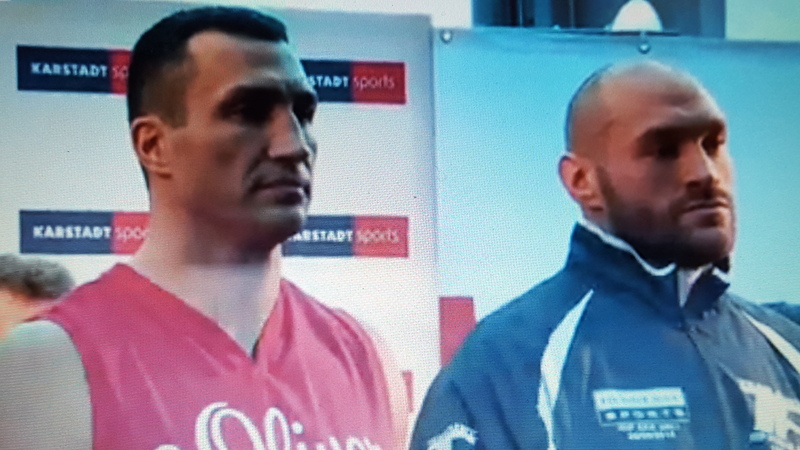 Hopefully, there will be a satisfying conclusion to tomorrow’s heavyweight title fight between longstanding champion, Wladimir Klitschko from the Ukraine, and Great Britain’s boxing bad boy, Tyson Fury. Klitschko is the WBO, WBA, and IBF champion. Klitschko weighed in at 246 lbs. and will be looking up at his opponent, one of the few times that has happened. The 6’9″ Fury came in at 247. Klitschko is 39 years old and enters the fight with a record of 64-3, 53 KOs. Fury is 12 years his junior with a record of 24-0, 18 KOs. Expect fireworks early. Fury seems determined to test Klitschko’s chin and endurance. Early on in his career, Klitschko was thought to have a “China Chin” (meaning “glass jaw,” meaning “he can’t take a punch”) and his stamina was even more suspect. When he came under the tutelage of the late Emanuel Steward and also Jame Ali Bashir, Klitschko became more durable, better conditioned, and more disciplined in the ring. If Fury is wild and not measured in his attack, expect Klitschko to use the jab and look to counter with the right cross. Fury fights from the southpaw stance, and that may prove problematic for Klitschko. However, it is unlikely that Fury will do something that Klitschko has not seen before. Klitschko is a student of the fight game which is why he has been champion for over a decade. The fight will be televised by HBO at 4:45 p.m. (EST). Due to the unrest in Europe, (the fight is being held in Germany) HBO has decided to have their broadcast team call the fight from their New York City studio. The fight will also be re-broadcast later tomorrow when HBO shows the Miguel Cotto-Saul “Canelo” Alvarez fight which took place last week. Check you local listings.